NWR welcomes Wildlife Management & Nuisance Removal (231)347-2540 which services Petoskey, Charlevoix County, Cheboygan County, Chippewa County, and Emmet County for all your nuisance wildlife removal needs. NWR is proud to welcome one of top nuisance wildlife industry leaders to our directory. 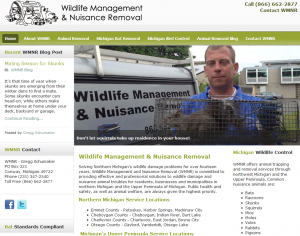 Wildlife Management & Nuisance Removal’s (WMNR) owner and operator is Gregg Schumaker. He is the National Wildlife Control Operator Association’s current president. Gregg is the past president of Michigan Animal Damage Control Association. So you can see that he is involved and passionate about the nuisance wildlife removal industry. A raccoon removal from an attic, out of a chimney, or inside a wall. Squirrel removal from soffits, attics, and / or walls. Bat removal and control, large or small bat colonies. Moles digging up the yard making it soft to walk on and dirt trails. Birds nesting under the foyer. Pigeons roosting in front of your business. Woodpeckers creating holes in your siding. And many other nuisance wildlife situations. Once the nuisance wildlife is removed the true work begins. Repairs, Prevention, clean up, and sanitizing with a wildlife removal deodorizer is really why anyone hire a professional wildlife removal service. Getting the animal out is great, but truly keeping them out is what Gregg specializes in. Wildlife Management & Nuisance Removal operates their services under the “Business Practices of the Wildlife Control Operator code. Never requires 100% of the money up front. They put all jobs in writing with a complete contract. WMNR carries the state required amount of liability insurance. Gregg offers a quality warranty for each nuisance wildlife repair situation. Call WMNR for your wildlife removal Petoskey, Charlevoix County, Cheboygan County, Chippewa County, and Emmet County.